THIS IS A FABULOUS PAIR OF OVAL DANGLE EARINGS THAT FEATURE A MOTIF MADE OF ABALONE INLAY SURROUNDED BY A BLACK BACKGROUND AND SET IN ALPACA SILVER. THE PENDANTS ARE OVALS WITH A SMALLER OVAL CUT OUT OF THE CENTER. 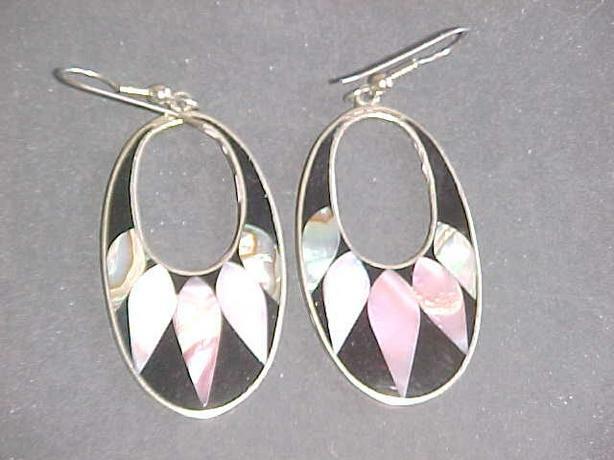 THE ABALONE INLAYS ARE SHAPED AS POINTED OVALS AND CONSIST OF 5 PIECES. THEY MEASURE 1 ¾ INCHES IN LENGTH WITH A TOTAL DROP OF 2 ½ INCHES. THEY ARE MARKED ON THE BACK ALPACA MEXICO AND ARE IN GOOD CONDITION.